Molly Sivewright, a Fellow of The British Horse Society and founder of The Talland School of Equitation, passed away on Wednesday 28 August aged 89. Mrs Sivewright was one of the greatest equestrian instructors this country has seen. She became a Fellow of The British Horse Society in 1961, was a Fellow of the Institute of the Horse (FIH) and a Fellow of the Association of British Riding Schools. In 1975, as Chair of the Exams Sub-Committee, Mrs Sivewright introduced the BHS Horse Knowledge and Riding (HK&R) Stage Exams and the BHS Intermediate Teaching Exam into the BHS examination structure. She was also instrumental in developing the use of anatomy and physiology into the training of horses and wrote two widely acclaimed books in the Thinking Riding series, as well as Lessons on the Lunge for Horse and Rider. Mrs Sivewright was a List 1 dressage judge and an international judge for show hacks and Arabs. She also held official authorisation to run courses for judges, riders and horses at national and international standard and enjoyed sharing her knowledge and expertise through a variety of lectures and demonstrations. It’s a number of years since I have been to Burghley Horse Trials and the early start on a wet, dark Friday morning was not the most inspiring start to the day!! However, as we arrived the atmosphere was building and as we waited by fence 2 in front of the beautiful Burghley House we all began to feel part of this special 4* event. This year the F&I Association were lucky enough to secure Eric Smiley (Irish Team rider and trainer of the Belgian team) for the course walk and we knew from the start we were in for an exceptional insight into the course from a rider, course designers and trainers perspective. Eric began by describing the importance of mentality when walking the course and placed the riders into 3 categories…either as a rider who wants to enjoy the occasion, those who want to complete or those who want to be competitive and be in the top 30 finishers, this was very much the theme throughout the walk. I looked back and saw that other Summer Newsletters were dated much earlier in the year than this one. My apologies but I’m sticking to the excuse that summer has only just started with this glorious weather! Ireland is determined not to get into the problems of earlier this year when, after a winter that started in August and ended in June, hay and haylage stocks ran out in many areas and we had to import from UK and France at vast sums of money. Now, the haymaking, silage cutting and haylage gathering is going ahead at full speed. Having been privileged to visit Coolmore Stud in Tipperary this month I saw HUGE lorries bringing in 100s of small bales of beautiful hay to be stored in a large barn and blown dry. To recap on our programme so far, members have been very busy organising events and training sessions for others to visit and gain even more knowledge of how our friend the horse thinks and works for and with us. All of these reports can be seen on the F&I web page – thanks to Sally and the Members’ Facebook page — thanks to Sam. March was the National Equine Forum which was attended by Jo Winfield & Sam Champney-Warrener. April saw the XC Training Day with international event rider Jeanette Brakewell. In May we walked the Badminton course with Nick Turner FBHS and enjoyed a dressage clinic with Judy Harvey FBHS. June brought a day with Carl Hester – dressage rider extraordinaire. Most recently we had an F&I Coaching and Discussion day with Jeremy Michaels FBHS in July. The reports for the above will all be on the F&I web page and Facebook. Many thanks to all the organisers for the time they have spent putting together these days which are both instructive and fun. Any ideas for additional events are gratefully received. Facebook, in the very competent hands of Sam Champney-Warrener, continues to go from strength to strength. It’s a great way of keeping in touch even if you only look once a week, so check with Sam and she’ll get you logged on. Sue Payne FBHS has agreed (with some persuasion from yours truly) to write the history of the F&I Association. Helped by others Sue has put together a fascinating article for British Horse Magazine. The Pat Smallwood Award is next on Sue’s list of topics. I’ve been talking to David Prince – editor of British Horse Magazine about raising our profile in the magazine and have set Jo Winfield on to a new mission! We now have our own column and I see in the latest issue we’ve been given our own ‘heading’ with a better place in the magazine – thanks Jo! Jo will always be on the lookout for ideas and copy, please send them direct to Jo. The F&I Association has also come to Ireland. We’ve had our first study day which was organized by Faith Ponsonby at the fabulous Coolmore Stud in County Tipperary. We have much more planned including visits to veterinary hospitals, a course walk at Balindenisk Horse Trials in September with Nick Turner FBHS – trainer of the Irish Team. On 21st October we have a different way of learning about dressage judging with Joyce Head BD List 2 Judge and her many interesting videos from International Shows. We have a new Fellow – Darrell Scaife FBHS. It doesn’t end there Darrell, we’ll be catching up with you soon so “be afraid, be very afraid”! Very sadly we have lost an extremely popular BHSI. As you may already be aware William Miflin lost his fight against cancer earlier this year. Following a brilliant idea by Lizzel Winter, the F&I Association collected donations for an engraved iPad so William could keep in touch whilst in the hospice. The incredible generosity of the equine world meant we collected far more than the cost of an iPad – £3540.00. 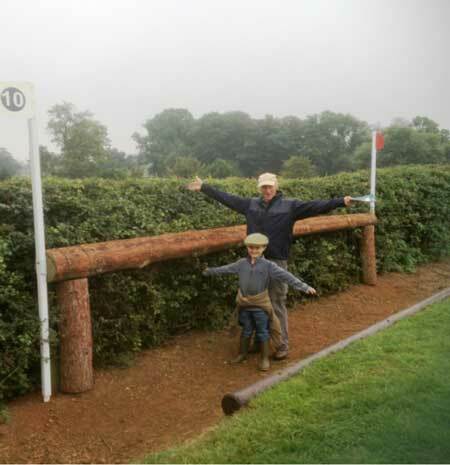 William asked for the balance to be put towards riding lessons for his children. William, his wife and children are in our thoughts. All that remains is for me to wish you all the best for your summer with your friends the horse.